Winner one year ago in Antibes, on Sunday 4th February, Li Jie of the Netherlands took another step forward in her quest to retain the title. 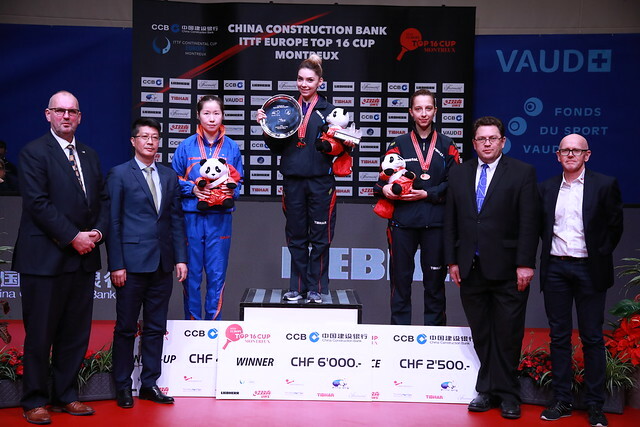 At the China Construction Bank 2018 ITTF-Europe Top 16 Cup in Montreux, the top seed, she beat Elizabeta Samara,the no.3 seed (13-11, 7-11, 11-9, 11-6, 13-11), on what was a day of mixed fortunes for Romania. Earlier, Bernadette Szocs had caused somewhat of an upset, the no.8 seed, she accounted for Sweden’s Matilda Ekholm, the no.5 seed, in four straight games (11-7, 11-9, 11-9, 11-9). Success, the wins mean that both players now qualify for the Women’s World Cup to be held later in the year; Elizabeta Samara must now play Matilda Ekholm for the third available place for Europe. Both wins were somewhat reversals of defeats in major competitions, last year at the Liebherr 2017 European Team Champions, Li Jie had lost to Elizabeta Samara; notably two years earlier in the Women’s Singles final at the Liebherr 2015 European Championships, she had also experienced defeat.